Since the launch of the ICRC AV archives database in February 2016, it is now of public knowledge that ICRC handles more than 90’000 photos, which are now widely available. Those photos cover all the activities ICRC could have in the Field. As the photo librarians receive new images, they sometime have an impression of “deja vu”. Those images do not mean that photographers lack of new ideas when taking photos, but that humanitarian action produces through years stereotyped images. What is very interesting is that it is possible to understand those images and feel the same emotions…no matter when or where they were taken. It also shows that humanitarian work – even if it constantly evolves – keeps the same roots. Time and place do not matter, what matters is our actions to beneficiaries in the field. Today, world water day, I’d like to share with you two interesting images. North of Jericho, Ein el Sultan, 1949. Refugee camp. 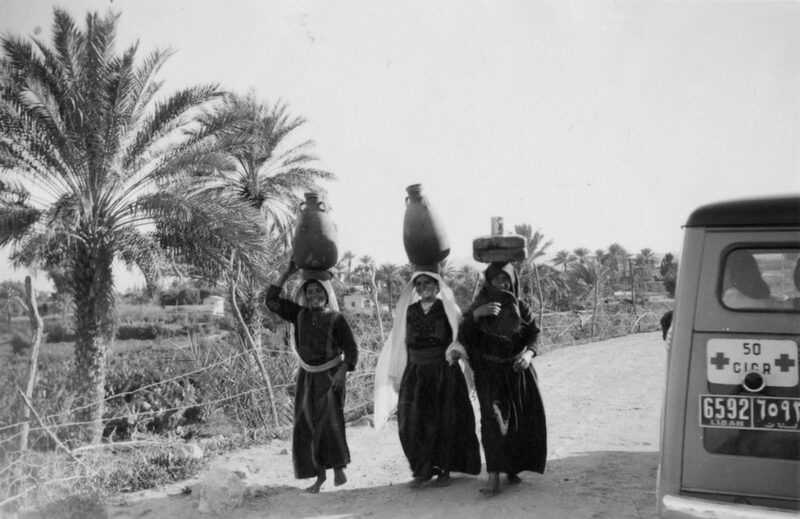 Arab women fetching water. ICRC archives (ARR) / SOMMER, Karen Margrethe. Sudan, 2004. Abshok camp, near El Fasher, for displaced persons. Walking back from a water distribution point. ICRC/RC Sudan/s.n. These photos are just two of many of ICRC strong (and counting) photo collection, which charts the history and activities of the ICRC and the International Red Cross and Red Crescent Movement from the 1850s to the present. [*]As a historian and with 10 years’ experience at the ICRC photo library, Fania Khan Mohammad has developed an intuitive and deep knowledge of the ICRC amazing photo collection. She is in charge of photo research and has been – and still is – involved in several publications and exhibitions such as “Humanity in War” or the forthcoming “Revelations” exhibition at the History and Art Museum in Geneva. CROSS-Files is the ICRC Library and Archives - including audiovisual archives - official blog. Its purpose is to highlight and bring out specific items or collections as a whole. We encourage researchers to explore ICRC History, IHL and humanitarian action through these collections and we provide tools to support this exploration.